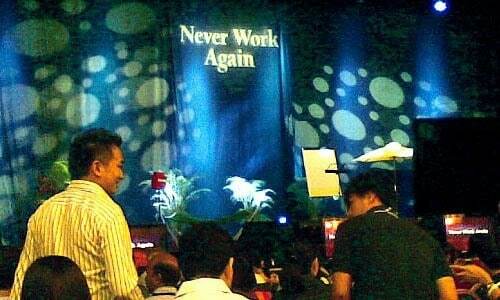 This is part 2 of my review for T. Harv Eker’s “Never Work Again” seminar held in June 2010. Be sure to read part 1: Never Work Again Seminar: Introduction before reading this post. As promised in my previous post, I’ll be reviewing T. Harv Eker’s Never Work Again 4-day seminar for the benefit of all readers. I just finished Day 1 yesterday and decided to write a daily review so that I can capture the thoughts while they are fresh. Overall Day 1 was disappointing. Honestly, I entered the seminar very eager and excited to learn and absorb new knowledge. But it fell short. I learned some concepts and strategies, but these didn’t measure up to the time spent there in total (9am-11pm; I left at 9pm) and certainly not with a seminar price tag of SGD 1,000-3,000 (USD 800-2,400). It honestly felt like the content was immensely stretched to fit the entire day and the lessons came across as really thin and sparse. I was expecting more as T. Harv Eker is supposedly a top guru in the seminar circuit alongside folks like Anthony Robbins. I’ve heard great things about his course MMI (Millionaire Mindset Intensive), and from what I’ve seen from the MMI booklet, it does look like a solid content-based course. NWA is supposed to be a level-up course compared to MMI which is a foundational one, but it certainly doesn’t come across that way. If anything, it felt more like a pitch fest to me. Tatt and O, PE readers whom I attended NWA with, both felt that Day 1 of NWA didn’t compare to MMI. Tatt paid SGD 1,995 / USD 1,600 for the NWA ticket, but only paid SGD 100 / USD 80 for the MMI ticket. O said that what he experienced on Day 1 was only a quarter the value of MMI’s Day 1. He gave day 1 a score of 5/10, while Tatt gave it a 6/10. I thought they were being generous; I’d personally give it a 3/10. In fact I gave it redeeming points for being a large-scale seminar, which I find quite energizing to be in the company of hundreds of other people with the same end goal. I feel this has more to do with the audience than the trainers though. Excluding this, it’s more like a 1/10. Does this elevate the audience’s lives? Does this give them information that they can act on right away? Does this create long-term, positive impact? This is the benchmark I use for both the workshops I attend and conduct. NWA Day 1 didn’t quite cut it for me. The important thing is giving Day 1 a score of 3/10 doesn’t mean that I feel I can do better or I know better; it just means that I’m measuring them against the highest standard which all of us should do, really. For what it’s worth, this NWA seminar run isn’t conducted by T. Harv Eker himself — it’s hosted by his trainers, Marjean and Marcus de Maria and an ensemble of speakers. I’ve a feeling that it might have been better if he hosted it*. Harv appeared by way of a recorded video clip from his past workshop which I found to be one of the better segments of the day. *Update: I subsequently spoke to people who have attended his live talks/seminars before and apparently he uses audience shaming techniques like insulting/criticizing people who walk out or go to the bathroom while he’s talking, insulting people who don’t buy the products at the end, guilting people into buying, etc. Reader Don shares his experience here. This is a very fear-based training tactic, and it’s not something that I endorse as a participant nor trainer. In this respect, especially in light of the fact that the NWA seminar is actually more of a sales pitch fest than a content-driven seminar (refer to the next 2 parts of this series to learn more), I don’t think that the seminar would be all that different whether he was the one conducting it or not. More talk than content = Hollow. There was way too much talking, big promises, and hyping up that kept circling round and round. Essentially what kept happening was that the host would say (paraphrased) “ARE YOU READY TO BUILD PASSIVE INCOME?” and “Get ready to learn some MASSIVE information today; you are going to learn many crucial tips and strategies to learn PASSIVE INCOME for the rest of your life,” but then nothing of this sort would happen for the next hour, or the next next hour, or 4 hours later, or 6 hours later. I found myself constantly wondering when the host would just get straight to point and get the next speaker out so we could start to learn something. It’s like I was promised a huge 8-course meal again and again but I barely got to taste the appetizer by the end of the day. Whatever value shared felt sparse. See Observation #5 below. Participants: I estimate about 400 to 500 of them. Participants came from all over the world, with majority from South East Asia (Singapore, Malaysia, Thailand, Indonesia, Vietnam, etc.). There were a few from Hong Kong, Taiwan, and China, and a small handful from Europe and the US. Most have attended MMI before — not surprising as it’s the foundational course for Harv’s seminar series and I believe these folks who are attending were sold NWA by the end of MMI. A very small handful are attending NWA for the second time. Speakers: There were a total of 8 speakers, including T. Harv Eker, for Day 1, including Marjean and Marcus. All the speakers were introduced as successful individuals — according to them, millionaires in one way or another — who have generated massive wealth for themselves through passive income. I have personally never heard of them besides Harv (obviously, since this is his seminar). Harv, in the true spirit of passive income generation, “trained” us via a recorded clip from his past NWA training in Singapore. I found it disappointing as I was looking forward to see him train live; it was also not mentioned anywhere to my best knowledge that he won’t be here live. Tatt and O were also surprised. I think if members paid thousands expecting to have Harv train in person, they’ll be disappointed. Lack of Structure: So far, the seminar feels disorganized, like it’s nothing more than different speakers and topics strung together in no particular order or significance. I think it can be more valuable to us if there is an overarching framework that connects the 4 days rather than just the topic of “come earn massive passive income”. Each day can have a specific theme that connects to the main theme of earning P.I. (e.g. Day 1: Investment, Day 2: Business Structure Creation, and so on). But there’s none of this. In fact, I still don’t know what I’m suppose to expect for Day 2, 3 or 4 except that I’m supposed to be learning more about making passive income. The staff seems largely clueless about what’s happening except being there to usher people. Requests for the event outline or at least some indication of what we would be doing the next 3 days were meant with clueless looks. Actionability of Strategies: It seems that there are 2 overall groups attending the workshop: (1) People who have a huge pile of money reserves (like upwards of hundreds of thousands or millions of dollars) and want to know how to use/invest that money to generate passive income, and (2) People who want to create passive income by investing their time and effort. So far, it seems that Day 1’s topics were targeted at group #1 and since I’m not going in as group #1, it bears little relevance to me. I expect more material for group #2 in the next couple of days. I also feel that many of the things the speakers shared may have worked for them in their home country (the US/UK), but I’m not sure if they’ll necessarily work in a different environment/landscape like SG. They were sharing more specific tactics than principles on passive income generation. These tactics come across as highly context-based, i.e. they will work in this time period in this particular place, but beyond that I don’t really know if they will hold. I personally find it much more valuable if I’m learning universal concepts that I can adapt and apply accordingly. Tactics wear out but principles don’t. Non-Endearing Host: Marjean kept complaining about how the audience’s energy was low (it wasn’t – this is just how the local audience is) and spent a fair bit of time preaching about how we need to give our 100% if we want to earn massive passive income. It was quite frankly, draining and a waste of time. Or maybe she was just doing it because there was no content to fill those gaps. It didn’t just happen for 5-10 minutes, but went on for quite a while, throughout the day. She’s probably a nice person IRL but as a host she came across as somewhat arrogant and authoritative. Half the time she was on stage, I wished she could just hurry up and pass on to the next speaker. No agenda/information. One thing I don’t like is how they don’t reveal who the speakers are nor share the agenda. I don’t know if it’s because the speakers are only confirmed at the last minute or if it’s to cut down logistical work from the printing/reprinting of schedules. Either way this means we don’t know what to expect — we literally only knew of each topic when the session started. For a seminar that costs a couple grand sga ticket, I really think the audience deserves better. Typos in handout. This is a nit-pick but I feel it’s important — there are a couple of glaring typo errors in the “declaration” sheet, an essential document in NWA. This is a declaration that you use throughout the seminar and have to continually read out the sentences every few hours. For a professional event like this and one where it has been conducted so many times (meaning the sheet would have been used many times), I’m really not sure how this happened. It doesn’t add to the image. Introduction. This took about 2 hours when it could have been easily covered in an hour. There were several important ideas I picked up, but Tatt later told me that these were just a recap of MMI concepts. This means that this value isn’t exclusive to NWA at all, and is redundant for anyone who took MMI (which is probably everyone since NWA is a step up from MMI). That means that if I had attended MMI, I would have rated Day 1 even lower, because I thought this was one of the better segments of the day. Beliefs on Passive Income. We addressed negative beliefs surrounding passive income generation, examined these beliefs in a somewhat brief way, and built new, empowering beliefs. I felt this was the crucial and should have been longer than it was. It was 1 hour long and can easily be extended to 1.5-2 hours IMO. From my understanding, Tony Robbins can go on for hours just addressing negative beliefs at his courses. How to write a bestseller book, by Harv, by way of a prerecorded video clip. This was one of the better segments in the entire day for me as book writing is in my interest area. No selling for a change and he shared his personal experience writing his own book. Literary agent/publishing. This felt like a fluff segment to me. The content was largely common-domain information. I had previously researched on getting an agent/ publishing and there wasn’t anything she shared that I didn’t already know. Anyone could have easily googled and found this information. I didn’t feel this was valuable, and it also doesn’t directly relate to the theme of earning P.I. Lease Options*. This speaker was very sincere and genuine; I really like him. However, this topic was not actionable for me — refer to Observation #5 above. It ended off as a sales pitch as he pitched his products/service at the end. Investment Pitch*. This was another sales pitch segment to invest in the speaker’s company rather than actually sharing content. If you’re not attending the seminar with ready money to invest, it’ll be totally irrelevant to you. Generating fast profits in hard times*. It wasn’t actionable for the same reasons listed in Observation #5. Licensing. Last segment for the day, 9-11 pm. Tatt, O and I didn’t stay on as the topic wasn’t relevant for us. Many people also left at this point. * These are sales pitch sessions. They follow this general formula: (1) A 10-minute introduction on why this particular method creates passive income, (2) 15-minute brief sharing on how they do it, followed by (3) 20-minute sales pitch for their course/program to learn this skill so you can create passive income for yourself. Note that the above is my own assessment based on my needs.